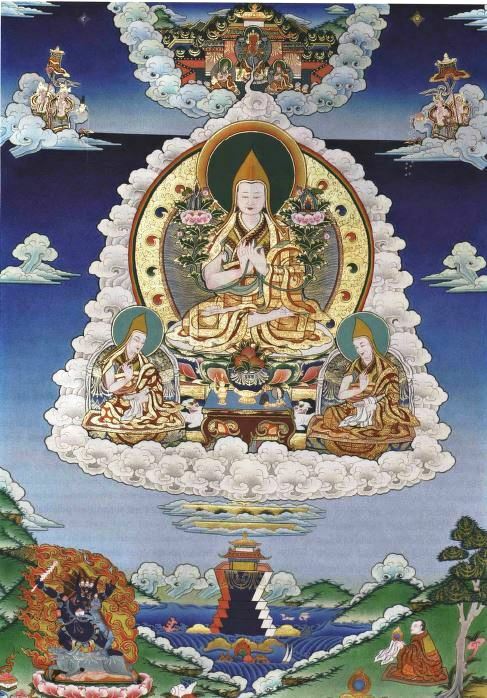 Over the hundreds of years that the four main schools of Tibetan Buddhism – Nyingma, Kagyu, Sakya, and Gelugs – have evolved out of their common roots in India, a wide array of divergent practices, beliefs, and rituals have come into being. However, there are significant underlying commonalities between the different traditions, such as the importance of overcoming attachment to the phenomena of cyclic existence, and the idea that it is necessary for trainees to develop an attitude of sincere renunciation. John Powers’ fascinating and comprehensive book, Introduction to Buddhism, re-issued by Snow Lion in September 2007, contains a lucid explanation of those similarities. One important point of agreement lies in rules of monastic discipline: All orders of Tibetan Buddhism follow the vinaya of the Mula-Sarvastivada school, which has been the standard in Tibetan monasteries since the founding of the first monastic institution at Samye. In addition, they also share the same body of philosophical and liturgical texts imported from India, and all four orders present a path to awakening that incorporates practices of sutra and tantra systems. They also share some common assumptions about the doctrines and practices they inherited from India. It is generally agreed that the Buddha provided divergent dispensations for various types of trainees, and these have been codified by Tibetan intellectual historians, who categorize Buddha’s teachings in terms of three distinct vehicles – the Lesser Vehicle (Hinayana), the Great Vehicle (Mahayana), and the Vajra Vehicle (Vajrayana) – each of which was intended to appeal to the spiritual capacities of particular groups.